Over 1 3/4 carats of fiery white old European cut diamonds bring your attention to this fabulous antique diamond yellow gold wedding band (1.88 ct tw). This fantastic antique wedding ring is perfectly made for either gents or ladies. In the middle of this ring, are two well matched radiant old-European diamonds, framed by an oval, slightly raised gold border. Two smaller diamonds adorn these center diamonds. Three glistening old European cut diamonds add fire to the corners of this ring, while twelve dazzling old European single cut diamonds frame the top and bottom edges. The contrast of these fiery white diamonds against this yellow gold background is striking, all mad in 14kt ( 585 ) yellow gold. 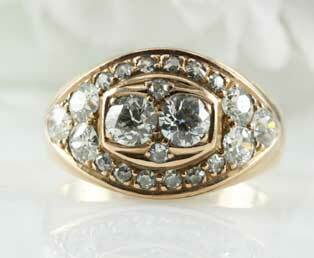 Old European cut diamonds were cut from about 1900 to 1920. This diamond cut is often confused with old-mine cut diamonds because they also have a higher crown, fewer facets than brilliant diamonds and open culet. 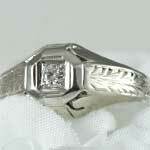 This old diamond cut is loved for their incredibly romantic dispersion of light, especially when viewed in candlelight.